This year, we celebrate 25 years of supporting LGBT media professionals and championing the highest journalistic standards in the coverage of LGBT issues. As we mark this milestone and celebrate the history of the LGBT community, we pause to reflect on where the organization has been. Twenty-five years ago, Roy Aarons gathered a group of journalists together in his San Francisco Bay Area living room to talk about the issues that face LGBT people in the newsroom. 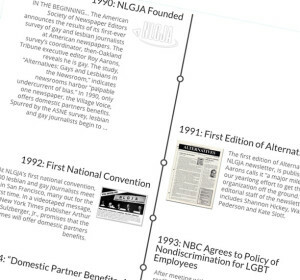 From that first meeting, NLGJA has grown to be the voice for LGBT people in newsrooms across the country. Click here to see some of the milestones along the way! This LGBT History Month, share your fondest NLGJA memories on Facebook or Twitter #nlgja25 and help us continue to tell our story and yours. The nostalgia continues all year as NLGJA celebrates our silver anniversary with events across the country. Coming up November 19th: Dateline:DC.